The globe is made of gilt-copper, and is in two halves, 6¾ in. (17 cm.) diam. The equatorial band is divided into twenty-four hours, the hours indicated by roman numbers and the corresponding latitude marked in arabic numerals. The 12 o'clock line passes through the equinoctial points. The globe makes a complete rotation in one day, moving from left to right, with the North Pole facing outwards to the observer. This means that the continents are viewed upside down, contrary to the way one normally looks at a globe. Because of this, the names of the continents and other engraved features are arranged to be read by the observer standing in front of the globe. Thus, in comparison with the usual view of a terrestrial globe, the lettering is inverted. As yet, this has not been observed on any other globe. The polar axis of the globe is held at North by a curved iron bar that is marked in degrees with a declination scale 0-23.5°. This permits the axis of the globe to be moved according to the season. Collection of the marchand-ébéniste Monbro (1807-1884); his sale, Pillet, Paris, 12-17 December 1859, lot 358. Sir Harold Wernher, 3rd Bt. (1893-1973), Bath House, London; after 1948, Luton Hoo, Bedfordshire, in the Old Dining Room and subsequently in the First Floor Corridor, and by descent. 1913 Bath House Inventory, p. 78, no. 397, in the Pink Drawing Room. P. van der Krogt, Globi Neerlandici, Utrecht, 1993, p. 335. E. Morpugo, Nederlandse klokken-en horologemakers vanaf 1300, Amsterdam, 1970. R.W. Shirley, The Mapping of the World, London, 1987, p. 606. Pierre Leroy, maître horloger in 1765, recorded at the corner of the rues Saint-Martin and Saint-Merry. 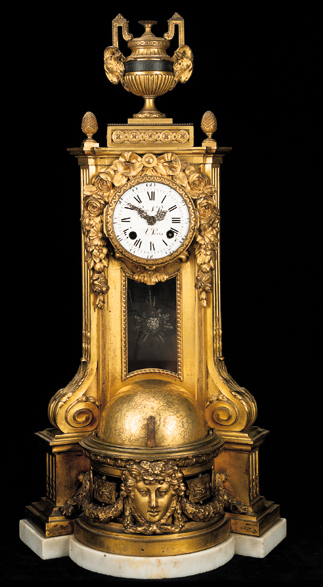 Conceived in the 'antique' manner, this superb clock features a flower-festooned dial incorporated in an urn-capped pillar, recalling 'Sacrifices at Love's altar' beneath a festive ram-headed urn that accompanies the bacchic 'thyrsus' cones on a glazed pillar, while its plinth displays the laurel-festooned mask of Apollo, god of the Sun and of Poetry. The powerful architectural design of the case indicates the involvement of an accomplished sculpteur such as Jean-Louis Prieur or Pierre Bernier. The only other example of this extraordinary model, incorporating an early-eighteenth-century terrestrial globe in its base, is one commissioned by the marquis de Brunoy in circa 1770 that appears in his sale of 1776. Subsequently in the collection of Alfred de Rothschild, Halton House, it was sold from the collection of Akram Ojjeh, Sotheby's, Monaco, 25 June 1979, lot 34 (£37,800). Some of the features are engraved as follows: Cercle Polaire Arctique; Cercle Polaire Anarctique; Tropique de Capricorne; Tropique de Cancer; GRANDE MER DU NORD; MER DU SUD ou PACIFIQUE; MER GLACIALE; MER DES INDES; EUROPE; ASIE; AFRIQUE; AMERIQUE SEPENT.LE; AMERIQUE MERID; NOUVELLE HOLLANDE. Some routes taken by famous navigators are also indicated: R. de Magellan en 1520; R. de la Maire; R. De Quiras; R. De Mendanna en 1568; R. de l'Aigle et de la Marie. Central America is recognizable, but the east coast of North America is constricted, and the West coast is purely conjectural. An impossible water-way is marked from Baye d'Hudson into the western ocean. The coast of Australia (New Holland) is also largely conjectural. Of assistance in dating the globe is the presence of the territory of N. Bretagne (New Britain), which is located by New Guinea at the very north of Australia (as engraved). This island was discovered by the English mariner William Dampier (1652-1715), during his voyage that departed from England in January 1699, returning in the middle of 1701. He sailed round most of the island at the end of 1699 and the beginning of 1700, and it was Dampier who applied the name "New Britain". Obviously it would take time for this name to become established and known to French cartographers. Of interest is the prime meridian from which longitude was measured. This is placed to the west of Europe through the furthest known islands. From the mid-fiftenth century the Portuguese took their meridian through the Azores, whereas the Spanish took the Canary Isles. In the present case the line is through the westernmost island of the Canaries, known as Hierro, or Ferro. It is named on the globe as: Premier Meridien fixé a l'Isle de fer. The exact distance from Paris was measured in 1724 by Louis Feuillée as 20° 1' 45", but the French authorities were advised to define the latitude as exactly 20° west of Paris. The globe is neither signed nor dated; as explained above, it must be dated to sometime after 1701. It does, however, resemble a French world map of about 1700, also anonymous, illustrated in Shirley, loc. cit.. Later states of this map are dated 1741 and 1763. The calligraphy of the map resembles that of the globe quite closely. The first recorded and only known globe written in French and published in Amsterdam is dated 1802 (van der Krogt). Christie's would like to thank Professor G.LE. Turner for his assiistance in cataloguing this lot.